What do the bobble-head on the left, and the medal on the right have in common? The answer is that both of these belong to Vin Scully. 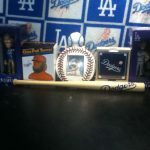 In 2015, the Dodgers gave out the Vin Scully bobble-head on the left, mine has never left the box. This week I was planning to write about this bobble-head when Scully received the Presidential Medal of Freedom, this is what the two have in common. You may ask, “Why did Vin Scully receive the Medal of Freedom?” This is a valid question, in fact I asked the same thing. It seems that the only way to understand why President Barack Obama chose to award Vin the award is by watching the video of Vin being told he would receive this award. White House Press Secretary Josh Earnest was was the man who made this phone call. 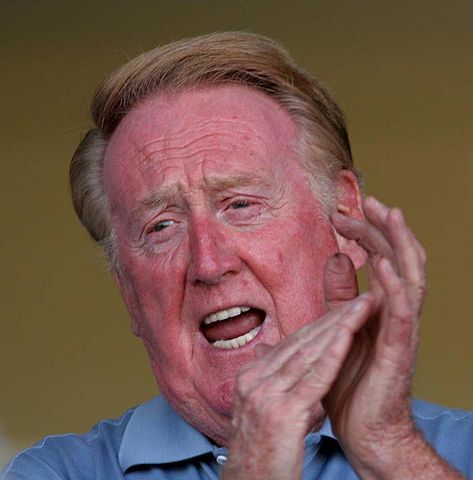 After Earnest informed Vin that he would receive the award, Scully responded by saying, “…are you sure? I’m just an old baseball announcer.” Of course we all know that Vin Scully is more than baseball announcer, he is the best announcer in the history of the game. Earnest pointed out that Vin has brought a decency and professionalism to this job. 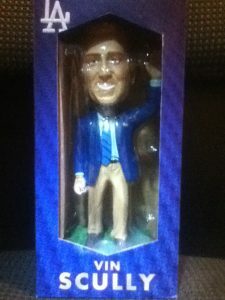 This is a really cool award that Vin Scully earned. As Joe Earnest said, it is the highest civilian honor a president can award. The video below shows president Barack Obama give Vin the award.